The Port of Seattle this week announced updates to its Central Terminal renovation, currently underway at Seattle-Tacoma International Airport. The nearly $17 million renovation is an investment by the Port to better serve passengers by adding 10,000 square feet of dining and seating space along with ADA accessibility improvements. The new Central Terminal configuration partially re-opens by spring 2019 and debuts a modern design aesthetic, new moveable, family-friendly seating configurations, a live performance stage and charging stations. Five restaurants will open on the south side of the Central Terminal by spring 2019, including: Pei Wei Asian Diner, a fast-casual restaurant that honors Asian culinary tradition by wok-searing; Lucky Louie, a Northwest inspired quick serve seafood concept by Seattle celebrity chef Kathy Casey; Pallino’s, a local fast-casual Italian-American eatery; Evergreens, serving up gourmet build-your-own salads, wraps and grain bowls to-go; and Koi Shi Sushi Bento with made to order Japanese delicacies. The Port also announced today two brand new restaurants, The Mariners Homeplate & Dugout Bar plus Salty’s at the SEA and BrewTop Social, which will open by summer 2020 when the Port completes construction of elevators and stairs to reach new mezzanine dining levels on the north and south sides. Both are two-level concepts that celebrate the Pacific Northwest with mezzanine level access offering incredible, expanded views of the airfield. Salty’s at the SEA and BrewTop Social will anchor the north end of the Central Terminal. 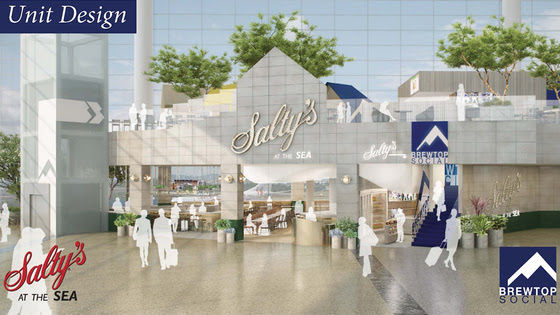 Iconic and acclaimed in the region, Salty’s at the SEA will offer a full-service seafood restaurant featuring a true Pacific Northwest menu with fresh, local ingredients on the lower level. Complementing Salty’s at the SEA, upstairs is BrewTop Social, an open-air concept that is a Pacific Northwest craft brewery tour in a bar with amphitheater style seating to enjoy live music on a dedicated stage below as part of Sea-Tac’s popular live music program. BrewTop Social will feature an expansive rotating selection of local breweries on tap and a separate play area for families. This dual-level concept is a joint venture comprised of Concessions International, one of the nation’s largest minority-owned airport concessionaires, Well-Buttered Bread LLC, and Nicholas & Associates LLC. Well-Buttered Bread is a local, woman-owned small business. Nicholas & Associates is a minority-owned Airport Concessions Disadvantaged Business Enterprise (ACDBE). The Mariners Homeplate and Dugout Bar brings Seattle’s Major League Baseball (MLB) team into the airport with a unique sports-fueled guest experience. In the downstairs Mariners Dugout, travelers can enjoy local craft brews, cocktails, small plates and gourmet dogs. Upstairs, the full-service restaurant will feature a Northwest inspired menu of all-American favorites. A show-stopping infinity bar upstairs will introduce sweeping views across the Central Terminal and out onto the airfield. High-definition televisions offer travelers an unobstructed view of their favorite sporting events and will draw passengers from all corners of the concourse. The Mariners Homeplate & Dugout Bar is a partnership between SSP America SEA II, LLC and Seattle-based ACDBE-certified businesses, Cyclo Corporation and Hyflyers, LLC, that hold 30 percent ownership. Salty’s at the SEA and BrewTop Social and The Mariners Homeplate & Dugout Bar were selected following an open and competitive bidding and evaluation process with seven rating criteria including background/experience, concept, unit design, financial/rent proposal, management/staffing and operations, job quality/workforce development, and small business participation. Both ownership groups include small, locally-owned and ACDBE firms. Sea-Tac Airport’s dining and retail redevelopment significantly expands the business opportunities at the airport. The Port set ambitious economic development goals to increase overall employment through dining and retail; increase revenue to the Port, which goes directly back into airport operations; and increase the gross sales of small, local, disadvantaged and certified Airport Concessions Disadvantaged Business Enterprises (ACDBE). ACDBE is a federal program designed to level the playing field for socially and economically disadvantaged firms competing for airport dining and retail business. The Port’s emphasis on equity in its competitive process is changing the equation for women and minority owned business while expanding dining, shopping, and personal service options for passengers. When The Mariners Homeplate & Dugout Bar and Salty’s at the SEA and BrewTop Social open, there will be more women and minority owned businesses operating at Sea-Tac than ever before. By 2021 when all of the new renovation will be complete, gross sales generated by ACDBE firms will reach approximately 22.7 percent compared to 21.4 percent in 2016. In addition, the number of locations operated in whole or in part by ACDBE’s will increase from 43 (56 percent) in 2016 to 65 (68 percent) in 2021. Poke to the Max: Sam Choy’s beloved Hawaiian poke menu in a bistro setting featuring fresh ingredients and homestyle ono grinds arrives on Concourse C.
Le Grand Comptoir: Featuring an array of wines from Washington vineyards and a regionally-inspired menu, this sophisticated wine bar opens on Concourse C.
Camden food co.: A healthful bistro dedicated to sandwiches and salads, opening on Concourse D.
Starbucks Urban Market: Complementing the offering of Starbucks with news, sundries, travel necessities and more, Starbucks Urban Market will have two locations on Concourse D and Baggage Claim that are opening in January. The News Stand and Broadcast Coffee: Bringing a modern era travel and newsstand concept with a coffee bar to the airport before the security checkpoints, this storefront includes Broadcast Coffee Roasters, an independent coffee roaster native to Seattle. Bambuza Vietnam Kitchen: Founded by Pacific Northwest native Daniel Nguyen and his family, Bambuza will serve Vietnamese menu selections featuring fresh, locally sourced ingredients starting in January in the newly renovated North Satellite. Caffe D’arte: Also opening in North Satellite in January, Caffe D’arte is a locally owned coffee roasting company originally started by Mauro Cipolla after moving from Italy to the Northwest in the 1970s. This location is operated by local ADCBE, Concourse Concessions, LLC. Skillet: Evolving from a scrappy Airstream food truck, Skillet is all about American comfort food prepared with classic technique and seasonal ingredients. Skillet is opening locations in both Concourse C and the North Satellite. Mi Casa Cantina: Headed for Concourse B in Q2 of next year, Mi Casa will offer fast, freshly made Mexican street food jam-packed full of an explosion of fresh flavors. Village Pub: Debuting in Q2 2019, this establishment is a modern twist on a traditional English pub. Operated by Airport Concessions, LLC. and located pre-security between checkpoints 2 and 3, Village Pub is a welcoming gathering place for food and beverages before heading to your flight. Stay tuned to dining and retail redevelopment news at Sea-Tac Airport here.